Holiday season offers endless opportunities to celebrate, relax, rest, reflect and meditate. 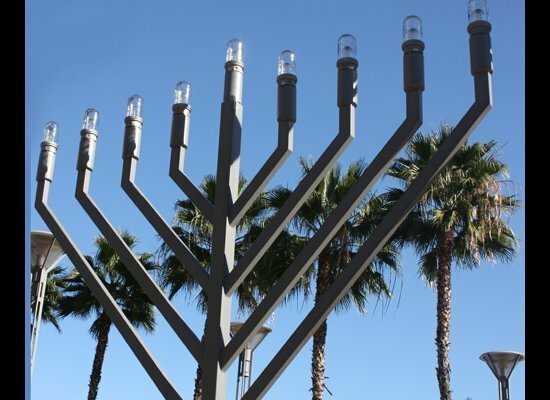 Whether you are enjoying a white Christmas or a palm tree Chanukkah, a mathematician in you might wonder if there is more to the story, a rigorous food for thought, if you will. So here is a brief guide to the holidays for the mathematically inclined. I have my own Christmas tree tradition. Instead of getting one, I watch new Don Knuth‘s “Christmas tree lecture“. Here is the most recent one. But if you have time and enjoy binge-watching here is the archive of past lectures (click on “Computer musings” and select December dates). If you are one of my Math 206 students, compare how Knuth computed the number of spanning trees in a hypercube (in a 2009 lecture) with the way Bernardi did in his elegant paper. Apparently, Fermat’s theorem on sums of two squares first appeared in Fermat’s long letter to Mersenne, written on Christmas Day (December 25, 1640). For background, see Catalan and French language Wikipedia articles. Zagier’s “one-sentence proof” is well known and available here. Long assumed to be mysterious, it was nicely explained by Elsholtz. Still mysteriously, a related proof also appears in a much earlier paper (in French), by a Russian-American mathematician J. Uspensky (ht. Ustinov). Can somebody explain to me what’s in that paper? Interestingly, there is a nice polynomial time algorithm to write a prime p=1 mod 4 as a sum of two squares, but I could not find a clean version on the web. If you are curious, start with Cornacchia’s algorithm for more general quadratic Diophantine equations, and read its various proofs (advanced, elementary, short, textbook, in French). Then figure out why Fermat’s special case can be done in (probabilistic) polynomial time. The dreidel is a well known Chanukkah game with simple rules. Less known is the mathematics behind it. Start with this paper explaining that it’s unfair, and continue to this paper explaining how to fix it (on average). Then proceed to this “squared nuts” conjecture by Zeilberger on the expected length of the game (I have a really good joke here which I will suppress). This conjecture was eventually resolved in this interesting paper, definitely worth $25 promised by Zeilberger. Now, if you are underwhelmed with the dreidel game, try to prove the festive Star of David Theorem. When you are done, enjoy this ingenious proof, which is definitely “from the book”. Most readers of this blog are aware of existence of beautiful mathematics. I can only speculate that a clear majority of them would probably deny the existence of Santa Claus. However, there are millions of (mostly, very young) people who believe the exact opposite on both counts. Having grown up in the land of Ded Moroz, we have little to say on the great Santa debate, but we believe it’s worth carefully examining Santa proponent’s views. Could it be that their arguments can be helpful in our constant struggle to spread the gospel of beautiful mathematics? We recommend reading “Yes, Virginia, there is Santa Claus“ column (fully available here), which was originally published by the New York Sun in 1897. In fact, read it twice, three times, even four times. I am reluctant to quote from it because it’s short and deserves to be read in full. But note this passage: “The most real things in the world are those that neither children nor men can see.” The new Jewish editor of the Sun reports that the rabbis he consulted think this is “a joyous articulation of faith”. Maybe. But to me this evokes some beautiful advanced mathematics. HAPPY HOLIDAYS EVERYONE! С НОВЫМ ГОДОМ! Categories: humor, Mathematics Tags: Cornacchia's algorithm, Don Knuth's Christmas tree lectures, Dreidel game analysis, Fermat's Christmas theorem, Guide to holidays, Santa Claus, Star of David theorem, Yes Virginia! As some of you figured out from the previous post, my recent paper (joint with Martin Kassabov) was accepted to the Annals of Mathematics. This being one of my childhood dreams (well, a version of it), I was elated for a few days. Then I thought – normal children don’t dream about this kind of stuff. In fact, we as a mathematical community have only community awards (as in prizes, medals, etc.) and have very few “personal achievement” benchmarks. But, of course, they are crucial for the “follow your dreams” approach to life (popularized famously in the Last Lecture). How can we make it work in mathematics? I propose we invent some new “badges/statistics” which can be “awarded” by AMS automatically, based on the list of publications, and noted in the MathSciNet Author’s Profile. The awardees can then proudly mention them on the department websites, they can be included in Wikipedia entries of these mathematicians, etc. Such statistics are crucial everywhere in sports, and most are individual achievements. Some were even invented to showcase a particular athlete. So I thought – we can also do this. Here is my list of proposed awards. Ok, it’s not very serious… Enjoy! A paper in each of Annals of Mathematics, Inventiones, and Journal of AMS. What, you are saying that “triple crown” is about horse racing? Not true. There are triple crowns in everything, from bridge to golf, from hiking to motor racing. Let’s add this one to the list. Some (hopefully) amusing variations on the Tripe Crown. They are all meant to be great achievements, something to brag about. Foreign lands – 5 papers in journals named after non-US cities (e.g. Bordeaux, Glasgow, Monte Carlo, Moscow), and five papers in journals named after foreign countries. Around the world – 5 papers in journals whose titles have different continents (Antarctica Journal of Mathematics does not count, but Australasian Journal of Combinatorics can count for either continent). What’s in a word – 5 papers in single word journals: (e.g. Astérisque, Complexity, Configurations, Constraints, Entropy, Integers, Nonlinearity, Order, Positivity, Symmetry). Decathlon – papers in 10 different journals beginning with “Journal of”. Annals track – papers in 5 different journals beginning with “Annals of”. prepositionist (gold) – ten papers which begin with a preposition “on”, “about”, “toward”, or “regarding” (prepositions at the end of the title are not counted, but sneered at). luddite (bronze) – paper originally written NOT in TeX or LaTeX. theorist (silver) – the implied constant in O(.) notation in the main result in greater than 1080.
ackermannist (gold) – main result used a function which grows greater than any finite tower of 2’s.